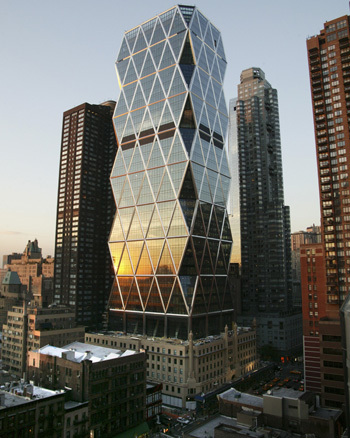 Constructing the Hearst Tower, showing the diagonal steel braces, each spanning several floors. Page of figures and data on this building. is the amazon starting to die? “When Dr Dan Nepstead started the experiment in 2002 - by covering a chunk of rainforest the size of a football pitch with plastic panels to see how it would cope without rain - he surrounded it with sophisticated sensors, expecting to record only minor changes. “The trees managed the first year of drought without difficulty. In the second year, they sunk their roots deeper to find moisture, but survived. But in year three, they started dying. Beginning with the tallest the trees started to come crashing down, exposing the forest floor to the drying sun. “By the end of the year the trees had released more than two-thirds of the carbon dioxide they have stored during their lives, helping to act as a break on global warming. Instead they began accelerating the climate change. “The Amazon now appears to be entering its second successive year of drought, raising the possibility it could start dying next year. The immense forest contains 90 billion tons of carbon, enough in itself to increase the rate of global warming by 50 per cent. “Nepstead expects "mega-fires" rapidly to sweep across the drying jungle. With the trees gone, the soil will bake in the sun and the rainforest could become desert. “At the British Association for the Advancement of Science meeting this week, Professor Eric Wolff described how the British Antarctic Survey has drilled two miles down to measure the concentration of gases in the atmosphere over a staggering 800,000 years. That is way before Man even thought of doodling on a cave wall. CO2 and methane have tracked temperature remarkably closely over that whole period: there has been no occasion in all that time when CO2 has increased without temperature following. These gases are now at levels that are unprecedented, and are rising at a spectacular, record rate. These ice cores show beyond doubt that humankind has changed the composition of the atmosphere. Increasingly this writer, Camilla Cavendish, shows promise. She is remarkably rational, thoughtful and steady in what I have read so far. Here is a considerable sample of her articles. “Under the voluntary scheme, drivers can go to a website http://www.targetneutral.com/ to calculate the cost of the annual C02 reduction needed to make their car C02 neutral. An average car, driven 10,000 miles a year, generates about four tonnes of C02. To neutralise that amount, BP says, will cost around �20 a year. It sounds like a piffling price to do your bit to save the planet. BP says a huge amount of C02 could be neutralised if all 40 million drivers in the UK signed up to targetneutral. With the UK government looking at carbon rationing, this is another step to charging consumers for the vast externalised costs of fossil fuels. “Points would be deducted every time energy was bought. Anyone exceeding their quota would have to pay a higher price for any more energy bought during the year while those below quota could cash in surplus allowances. “Starkey said uncertainties included whether some people -- those living in cold northern regions or people with large families -- might demand extra allowances. “The five million Chinese GM cotton farmers appear to have created a natural vacuum by growing cotton genetically engineered to kill the bollworm larvae which used to destroy their plants. With the bollworm larvae gone, other pests called mirids have taken over, forcing farmers to eradicate them with lashings of expensive insecticide that have all but destroyed the original economic benefits. “When GM cotton was first grown in China in the late 1990s, it produced miraculous results that were hailed as proof that GM technology could benefit poor farmers. They saw great gains - in the first three years of planting the crop called Bt cotton - they cut pesticide use by more than 70%. And then there will be cane toads sayeth the lord! To those that envisage major administrative and other problems with this scheme, great bureaucracy is not necessary - just issue a book of ration coupons or carbon money, or the carbon ration could enforced by a tax on prime industrial users. Some people appear to be confusing the idea of the carbon ration or tax with an energy ration or tax, but of course renewable and nuclear energy would not attract much of a carbon tax. There may indeed be privacy issues, but that is a problem the citizens will have to adjust to, or learn to solve. As I keep pointing out, we are headed for a transparent society. I do not see much that anyone can do about it. It is not essential have to register for rations, those who wish to opt out could buy what they wish from the open market trading. Tragedy of the commons issues are not a private matter. Then comes land depletion, if farming methods are not top line. “China Xiwang Sugar Holdings said it has obtained government approval for US corn imports, which signals that Beijing will no longer stand in the way of the grain's trade. “A manager from Xiwang, one of China's top corn sweetener producers, said Wednesday it received the certificate for imports of 50,000 tonnes of genetically modified corn. “They saw more potential trade as domestic corn prices have been high, particularly in Shandong, due to rising demand from the corn processing industry.